White-nose syndrome (WNS) has devastated bat populations throughout eastern North America since its discovery in New York in 2006. This disease, which has advanced into nineteen states and four Canada provinces, has even devastated entire colonies of bats in some regions. Common symptoms include gathering near hibernating dens, and flying about during the cold days of winter. Bats have been found dying and ill on the ground outside of their hibernating areas. Recently, the U.S. 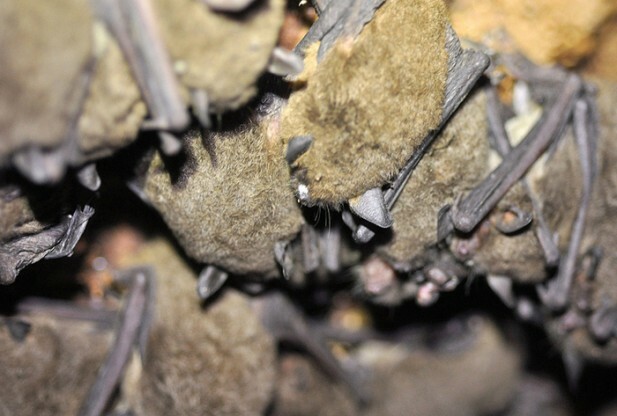 Fish and Wildlife Service (FWS) verified the first cases of white-nose syndrome within colonies of the endangered gray bat (Myotis grisecens) located in Montgomery and Hawkins counties of Tennessee. Cases of WNS have previously been documented in other federally protected, hibernating bats, including the Indiana bat (Myotis sodalis). In the Northeast and Mid-Atlantic states, numerous deaths have been reported within Indiana bat populations. Although there have been no recorded mortalities within gray bat populations, there is much reason for concern for the gray bats. The Nature Conservancy (TNC) and the Tennessee Wildlife Resources Agency (TWRA) discovered the cases of WNS while on two separate winter observation expeditions. The biologists found white fungus on the gray bat’s snouts, tail, and wing membranes, which is typical to white nose syndrome victims. After collecting individuals from these colonies, the histopathology department at the Southeastern Cooperative Wildlife Disease Study (SCWDS) at the University of Georgia diagnosed the disease. Following the diagnoses, USGS National Wildlife Health Center in Madison, Wisconsin confirmed these cases. In 1976, the gray bat was listed as an endangered species by the federal U.S. government. These bats reside in a limited range within limestone karst areas of the southeastern United States, and most of the bats occupy caves throughout the year. They are vulnerable to habitat destruction due to the large amounts of individuals living within small amounts of caves. Efforts to keep humans away from gray bat inhabited caves have proven effective in maintaining and restoring the gray bat populations in many areas. The possible effects of WNS on the two gray bat populations discovered are not yet fully known. The symptomatic fungus was noted on many hibernating bats within the caves, but no other signs of the disease or mortality were found. Once the study is completed, the results will be published in a peer-reviewed journal, and the gray bat roosts will remain under observation in order to record any damaging effects. The U.S. Fish and Wildlife Service is conducting a joint effort along with federal and state governments, as well as non-government agencies, tribes, and universities to research and control the spread of white-nose syndrome. The Service, in addition to cooperative efforts, has funded many research projects in order to understand WNS better and learn how to manage the disease. The Service has also created scientific protocols and assistance for land management agencies and other associates. For more information about white-nose syndrome, visit http://www.fws.gov/whitenosesyndrome . For more information about the federally listed endangered gray bat, visit http://www.fws.gov/midwest/endangered/mammals/grbat_fc.html .